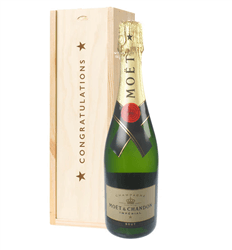 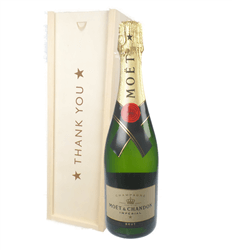 The best selling Champagne brand - send a single bottle of Moet & Chandon Brut Imperial Champagne - Harmonious Assemblage of Chardonnay, Pinot Noir & Pinot Meunier. 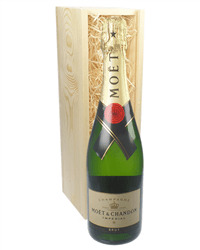 The bottle is presented in one of our own 'Happy Christmas' branded wooden gift boxes. Christmas is always a time for celebration and what better way to celebrate than with a bottle of Champagne. All the Champagnes we sell are now available in one of our fantastic, festive 'Merry Christmas' branded wooden gift boxes, so whether you are sending a single bottle gift to your Great Aunt or a whole batch to a large corporate client, these look superb and definitely get the Merry Christmas message across in style.